IS fits this definition perfectly. It started as a tiny nucleus of terrorist operatives, evolved into al-Qaeda in Iraq and erupted into a full-scale insurgency with significant local and international support (Peter Berger, 2015). Imagine IS, less than one-hundredth of 1 percent of the world’s 1.6 billion Muslims, managing to spark an endless controversy over what is and what is not Islam. With a few thousand fighters, they managed to capture (for a while) Mosul, a city of 1.5 million people. But perhaps there is no better example for IS as a femtorisk than its social media presence. One study from the Brookings Institution (2015), for example, estimated that there were at least 46,000 Twitter accounts that were used by IS supporters between September and December 2014, with an average of 1,000 followers each, considerably higher than ordinary Twitter users. Indeed, this was one of the most useful tools for IS to amplify (and sometimes exaggerate) its influences through social media. Aside from Twitter, IS is also very good at spreading radical propaganda through Facebook, Instagram and YouTube. They aren’t shy about using Hollywood-like movies to promote their lifestyle. We can see whenever there are any casualties inflicted by its members, such as in the Paris attacks, that IS quickly uses them to spread “fear”, which results in amplifying their influence. This is when Indonesia’s small acts of defiance through social media come into play to deal a huge blow to IS. Not only does it use the moment faster than IS can, it ridicules the effect that IS tries to use to amplify its social media propaganda. For a group whose media strategy is to amplify its brutality through social media to scare its enemies (Adam Weinstein, 2015), to have its stage taken away in front of its eyes, it is analogous to a paper tiger. 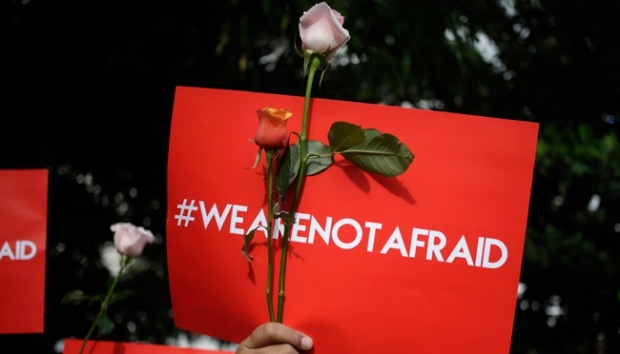 When they not only failed to cause serious damage in the attack, but also on social media, the only thing that was amplified was the antithesis to IS’ goal: that fear is not in our dictionary. This means that IS will remain a tiny nucleus with no real power in Indonesia. Or in simpler words, IS just does not belong here in Indonesia.